Kaleidoscope comes from two Greek words: kalos, meaning “beautiful,” and eidos, “shape.” And indeed, education takes on a beautiful shape when all children belong and are valued as contributing members of the school community. That is the vision of inclusive education; it drives decisions, actions, and core beliefs. Repeated reflection helps shape effective practices to meet the needs of all students. When we add the word “friends” to that image, the result is a myriad of relationships that provide opportunities for the support and growth of all children. The frame for a kaleidoscope is a circle. All variations of color and shape occur within. The circle represents a safe and inclusive school and community environment. Who do we include in this circle? Parents, who accept the responsibility to provide a home environment that encourages their child’s success in school and in life. They stay informed and involved in their child’s education at school and in the community. Our friends are also teachers who recognize the needs of each child and provide specially designed instruction and support. In inclusive schools, the shared ownership for student success extends throughout the entire school community – from bus drivers to crossing guards, from administrators to custodians, from cafeteria workers to front office personnel, and everyone in between! Together they work to foster relationships within the school and create awareness of effective inclusive practices. Let’s look closer within the luminous “kaleidoscope of friends.” We see the students who, as positive role models, welcome, respect, and support their fellow classmates. The power of meaningful friendships to increase appreciation and acceptance of individual differences prepares students for adult life in an inclusive society. The positive effect of respectful peer relationships on bullying and safe school environments has been well documented. However, as in a kaleidoscope, we have to adjust the many parts of our school community to create innovative patterns that shape our schools into inclusive environments where all students can learn. The goal is to nurture a caring community of learners with the power to reflect a vibrant light of understanding and mutual respect. There is no better time than now, during Inclusive Schools Week, for us to reflect, sharpen our vision, and learn what is working from each other. 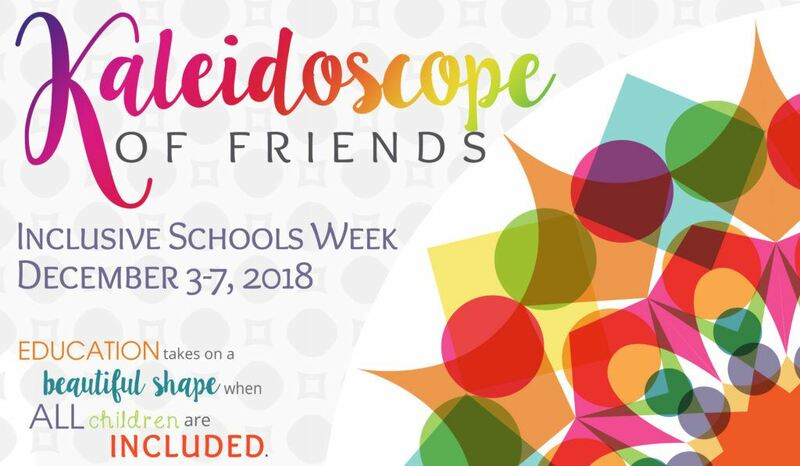 Share with us your “kaleidoscope of friends” as together we once again celebrate the many beautiful shapes of inclusive schools throughout the world. SHARE YOUR CELEBRATIONS ON SOCIAL MEDIA WITH #ISW2018! An Inclusive Schools Week Collaboration - an activity guide which is meant to be utilized by teachers during Inclusive Schools Week 2018. Find ISW Activities and Lessons HERE - Enjoy a lesson planning template and hundreds of lesson ideas !